Return of the Get Sum Dim Sum ride! We stopped hosting the “Get Sum Dim Sum Ride” years ago; but now, after many months of research and test rides, in collaboration with LA Cycle Tours, I am proud to announce that the Get Some Dim Sum Tour is now live on the LA Cycle Tours web-site! 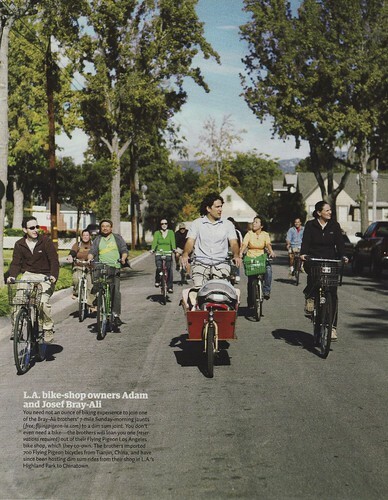 Back in August of 2008, Flying Pigeon LA co-founder Adam Bray-Ali had a genius idea after brainstorming with his friend Huy Tran: promote Flying Pigeon bicycles with a weekly ride to a dim sum restaurant. The ride was a great way to introduce Flying Pigeon bicycles to new people, and to help spread the idea of riding a bike in the city as a fun way of socializing. 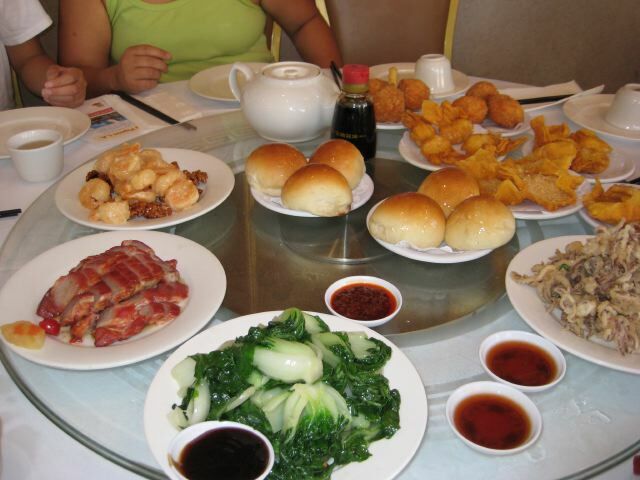 The experience of trying tons of different dim sum restaurants was an excellent bonus. The Get Sum Dim Sum Ride was featured in March of 2009 by Sunset Magazine. Image by Chris Lechinsky. Sunday after Sunday, we marshaled our bikes, rallied our customers and fans (many of whom became close friends over the months, and then years), and headed out to a dim sum restaurant. The ride, and our shop, got picked up in the local and national news. We were a featured story in Sunset magazine. The idea was a hit! Fast forward to 2017, the ride and the shop were closed down (so I could pursue a run for city council in Los Angeles). After losing the election in May of 2017, it took many long months to recover my sense of self again. With the shop gone, most of my day-to-day social life had evaporated. My friend Art Palacios, founder and owner of LA Cycle Tours, heard I was loafing around feeling sorry for myself, so he asked me to help out with some of his rides from time to time. Art and I met through the social bike ride scene in LA. We have both organized and participated in hundreds (thousands?) of group rides over the years. We also share a common bond: we love this city, and we love to show people how wonderful it is to experience it on two wheels. Art has been running a LA Cycle Tours for several years – making a living doing what he loves. His most popular tour is the Taco Tour in the Boyle Heights neighborhood of Los Angeles. The question came up between us: could a similar ride for LA’s amazing selection of Chinese food, history, and culture be done? We dug in to researching the story of the Chinese in America, the history of the tea house in China, the history of tea, the origins of dim sum, the names and varieties of the dishes, and the history of Los Angeles’ Chinatown. We also ate a ton of bao, dumplings, noodles, duck, pork, and even a few chicken feet while we zeroed in on the best way to both tell a story about a community and share some of the best food from small, family owned, businesses in town. The result of our collaboration is the Get Some Dim Sum Tour! We have scheduled a bunch of tours for January of 2019, and are working out our schedule for the first quarter of the year now. The price of the tour includes the use of LA Cycle Tours’ bicycles, helmets, and covers all the food. You can check out the Get Some Dim Sum Tour schedule here. Comments Off on Return of the Get Sum Dim Sum ride! 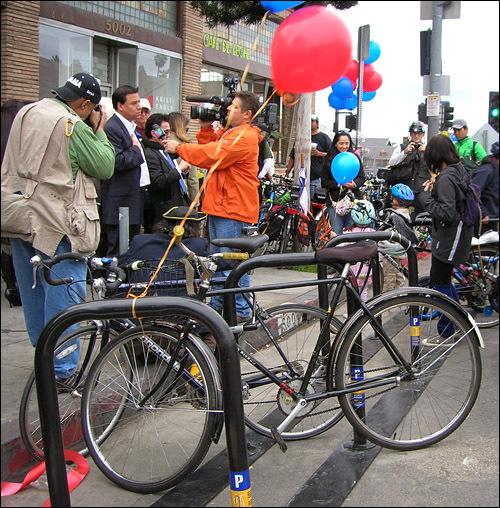 Comments Off on Whither #bikela without Huizar? 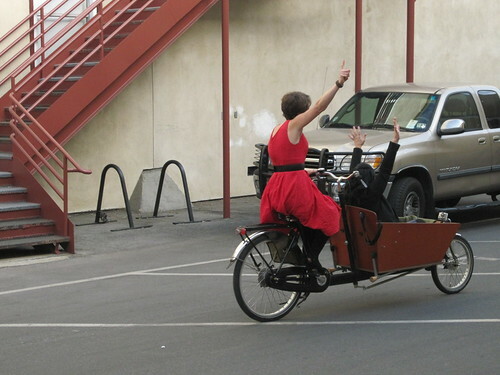 When it comes to riding a bike in Los Angeles, I bounce between two philosophical states. I have found that mainstream politics, and my own political ideology, have sometimes kept me from enjoying the simple pleasure of riding a bike. First, bike riding in this city takes grit. It takes physical strength. It takes mental toughness. You have to be alert, and you have to aggressively advocate for yourself, to yourself, while you navigate our profoundly dysfunctional, car-centric, streets, politics, economy, and culture. Second, riding a bike in Los Angeles is usually an incredibly good feeling. It is so easy, so refreshing, that the broken glass, insanity, noise, dysfunction, poverty, violence, trash, pollution, strife, inequality, and vice that you breeze through count for very little. Instead, you have direct access to the story of this metropolis, the people who live here, the food they cook, the architecture they build, and the ideas they espouse. You roll through a rich fractal of human life and the fragments of the natural world that still eke out an existence in the city. The sun rising, and the sun setting, the wind, coyotes at dusk, the freedom to experience a day as a human should without the penalty of tired feet or an aching back – it pulls a person into the experience of being alive and costs only the time you would spend anyway running an errand or fulfilling an obligation for work, or school. I have written, in earlier blog posts, how the politics around making this city a better place to ride a bike (more bike lanes, better bike lanes, full consideration of cyclists needs in the halls of power) has just about collapsed in on itself. Various political factions and non-profits turn on each other – shattering the fragile, diverse, coalitions built up in the mid-2000’s to support cycling. Cycling politics, however, is not the same as simply riding a bike. For too long, I focused on the grit, on the fight, on the aggressive advocacy for a better city to ride a bike in. The end result: a loss in city hall on a policy issue could make me stop riding a bike for weeks or months in frustration. The words of a non-profit executive director could take away the simple joy of coasting down the streets in my neighborhood to pick something up from the store. The city will go bike-crazy again, some day. It took almost 100 years for the late 1970’s bike boom to hit after the first cycling craze in the late 19th and early 20th century faded away. Then, the early 2000’s came along and we had a little surge of interest which is now fading away. Maybe my grandchildren will be shouting down a group of bike crazies asking for routine accommodation in road design in a public hearing some distant day in the future. For the time being, I am trying to take it easy. Let the machine I am riding give what it has to give. I stopped demanding that every day be a victory for safe-streets, a better city, or a happier-people ideology. It takes grit, it takes strength – but it also takes letting go. With practice, I will be able to simply enjoy being alive in this profoundly messed up town. The image above is from a vigil for “Bizzy” – killed by a speeding drunk driver at Marmion Way and North Figueroa Street. This post is a response to a defamatory, slanderous, unhinged blog post by Sahra Sulaiman of Streetsblog LA published one week before the May 16, 2017 General Election for the Los Angeles City Council District 1 seat I was a candidate for. You can read Sahra Sulaiman’s biased rant here. My response was originally posted as a comment on Streetsblog LA but was labelled “spam” by Streetsblog LA staff. I am still shocked that Sahra Sulaiman’s essay was published on Streetsblog LA. First, because of the multiple instances of (what I interpret) as an intentional misreading of nearly everything I’ve written online. Second, because of the highly personal nature of this attack and its proximity to an election in which I was the “better” candidate for all the issues that Streetsblog LA was founded to support in local politics. My disagreements with some, not all, of what Sahra Sulaiman has written and said in the past had to do with the practical politics of installing bike infrastructure, pedestrian projects, and generally building up (instead of tearing apart) the political alliances that have come to define whatever the Livable Streets movement was at a given point in time. I felt, and I still feel, that several of her articles and some of her positions are counter-productive in a practical sense. For example, yes, I agree with her reading and description of unequal police response when it comes to traffic stops. No, I don’t think that is reason enough to stop forward momentum on the installation of bike and walk infrastructure in communities of color – which despite her protestations, is exactly what she’s advocated for regarding Central Avenue. I bring up the example of Central Avenue bike lanes to highlight that I have been consistent in my desire to see on-the-ground projects built and legal changes made. Saving lives and helping enable a measurably healthier, happier, and economically productive life for as many people as possible is why I got into this movement. Sahra, I feel, often wants to highlight an ethical or moral failing either of a large system, or of an individual – and will do so quite effectively, but will sacrifice seeing what works to address issues of physical safety, physical and mental health, in order to achieve the communication of a larger injustice, or make an ethical or moral point. She is very good at what she does, but her results speak for themselves – there isn’t a project in this city, or a law or change in policy, that I’m aware of that can be chalked up to her journalism. I’ll admit: I have a tendency to move to verbally stomp on anyone attempting to narrate the future of this city away from the endpoint of safer streets, healthier people, and a fiscally sound local government. This isn’t always the right move, practically speaking, but it is one honed through years of slogging through meetings, rallies, and events as a vociferous advocate rather than as a scared bystander – and watching friends, acquaintances, and neighbors die or be grievously injured in preventable car crashes while riding their bikes, or crossing the street. It wasn’t until I found a voice as a self-schooled transportation policy analyst and a rhetorical bomb thrower that my work started moving policy decisions, and peoples ideas about this city, in a given direction. After the devastation I felt following the death of 17-year-old Andres Perez at Avenue 60 and North Figueroa by a city truck, I put that part of my personality aside. I have been desperate for change in the dangerous streets in my community, but attacking Councilman Cedillo rhetorically about traffic safety simply wasn’t enough. I had to broaden the attack, and build outrage for his term in office around more than traffic safety. In my run for city council, I was able to bring together several disparate political groups – including some of our local closet conservatives, by focusing not on righting injustices but on addressing practical problems we all want to see solved. I worked to help people find common cause with those they normally would write off as being the wrong skin color, the wrong ethnic background, or wrong class. This problem of writing off the value of a coalition with “the wrong sort” of people isn’t limited to right-wing groups and people. In fact, many of our city’s self-proclaimed “inclusive” groups and leaders are deeply vested in insulting and walking away from working with anyone symbolically of “the wrong sort”. It isn’t easy to do what I did in a city this complex and diverse, and I’m proud that my door knocking efforts to sway voters by talking about repairing park bathrooms and making it safe enough for everyone to cross the street to buy something from the local store found success with voters. As someone who has been a part of the conversation on Streetsblog LA from its beginning, a true believer in what the site and those who worked on it stood for, I cannot express how disgusted I am to have ever trusted the bonds I thought our shared efforts over the years represented. That a defamatory headline, a slew of personal attacks in the heat of a political campaign, would send all the “brave” and “fierce” and “courageous” (to judge by their Instagram and Facebook feeds, and my former opinion of some of them) safe streets advocates running for cover speaks volumes about what this “community” really is, how fragile our power was, and how badly it has been fractured, not by my campaign but by the intrusion of identity politics into our everyday lives. If a decade of actions and words, what amounts to the central project of my entire adult life, can’t stand up to partisan sniping before an election and whatever motivates Sahra Sulaiman to produce unhinged rants – you can expect the pace of bike lanes and sidewalks to continue to slow, the pace of street deaths to increase, and for the winds of politics to wipe away the political and cultural opportunity that had opened for a more livable Los Angeles. That is certainly the case in Los Angeles’ 1st District for the time being. My comments are being blocked on Los Angeles Streetsblog while the words of my critics (on other posts) are left up. Why? Who else is being silenced in the livable streets community? I suspect my comments are being blocked because the site, at this point, is little more than a black hole for tax deductions and ego stroking for their miniscule well-heeled donor base. The last thing the site exists for is working towards solving any of the problems in our local transportation and land use system. My existence, my voice, and the voice of anyone complaining “Hey, isn’t this about safer streets and a more livable city?” is a threat to the often bizarre meta-narrative of divisive, tail-chasing, identity politics the site has been sidetracked on for several years now. The reporting from the past couple of years has turned into either bystander journalism (e.g. “I attended a public meeting! My NGO friends are great!”); evoking an “Oh dear!” and little else from the readers; or, worse yet, silencing real conversation and debate by making any questioning of a blog post a symbol of how hopelessly gauche, dishonest, or racist the questioner is. Every other week the site presents one great injustice after another with no means of moving forward other than trusting in the executive directors of other tax deduction puppy mills or lighting candles to the technocrats in some obscure office in Downtown. My recommendation: if you are a donor, take your money elsewhere. If you are interested in livable streets in Los Angeles, for the time being (and like always), you’re on your own once again. It has been over a year since I hauled the last box of stuff from the Flying Pigeon storefront; just a few months after that my campaign for city council went down in flames. I was falsely accused of racism, homophobia, transphobia, fat hate, anti-Mexicanism, anti-Americanism and had a horde of intellectual gate-keepers in this city screaming at me to apologize and disappear. People with whom I had worked for years, people whose causes I had donated time, passion, and money to, people whose values I thought I shared denounced me on the basis of a series of pre-election partisan attack pieces. So, what comes next? For me, pretty much nothing. I’ve been doing more housework; repairing appliances; dropping off and picking up my kid. For the bicyclists and safe streets advocates in LA, the answer is simple: we’re mostly screwed from now until at least 2020 and most likely 2022 and beyond. Like government officials and politicians, non-profit executives and journalists get paid if things stay broken and their donors only give when things are. Whatever political hand we held in local politics has been exposed as an empty bluff. Our self appointed “leaders” in livable streets politics will ignore years of actual work, building political coalitions across mainstream political lines and across economic and cultural divides; our “leaders” will walk away from practical politics at the drop of a blog post in order to score invisible points in a fight for temporary moral high ground in the pot-holed field of identity politics. Perhaps this is why the bike community held some sway for a few years: we used to get together and coordinate blog posts. We also used to get together for more than drunkeness and drug abuse on two wheels. 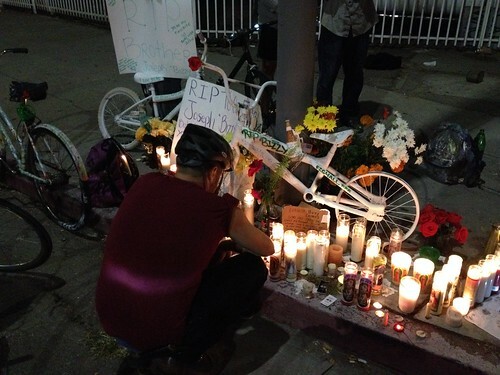 What ails this country now ails the bike community in Los Angeles as well – and that is how it will go for the foreseeable future. We will continue to die and be injured on the streets. Our elected leaders will mock our deaths as they mock our lives and what little power we have. 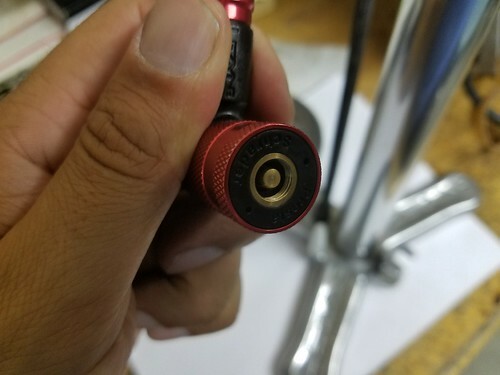 Our power, as cyclists collectively pushing for safe streets, will dwindle as paid advocates in non-profits work diligently to silence and contain any legitimate, and easily addressed, grievances with accusations of “white fragility”, structural racism, equity, and bigoted arguments against our views based on characteristics like our biological gender or the color of our skin. On the other side are all the same old red herrings protecting the status quo: car-only streets are “more efficient”; “Get a job, hippy.”; “This isn’t [insert city or region where streets are safe].”; “Tax bicycles!”; “Bike lanes will slow emergency response times.”; “Idling cars means more pollution.”; “Lance Armstrong wannabes.”; etc., etc., etc. There is no escape from the trap that we have laid out for ourselves other than to do what cyclists were doing in the 1990’s – developing in each individual person the skills and knowledge to pass on the humble flame of hope on two wheels. The time has come again to wait, and watch, and prepare. 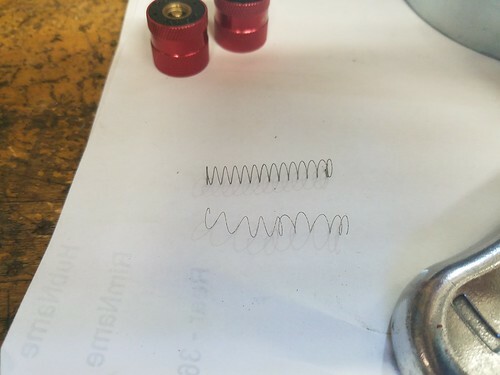 The doing season is over. What comes next? Just one call out blog post, civic catastrophe, and ecological calamity after another until we see a chance to break through again with the dream of a city that is built to respect human needs over motorized transportation. Comments Off on So, what comes next? A Flying Pigeon bike shop, that is. Central location between a Gold Line stop and what could be one of LA’s most significant bikeways and all-around shopping street, if Joe Bray-Ali wins his race to replace “Roadkill Gil” Cedillo in CD1. Joe’s put the renowned Flying Pigeon LA shop that sponsors this blog up for sale, and the proceeds will go right into his campaign. If he wins, the North Figueroa road diet that a previous incarnation of the City Council approved in a unanimous vote will be built. It was funded, designed, and ready to go, and only Cedillo’s petulance has kept Figueroa the Slaughter Alley of Northeast. And if Joe wins, you win: your shop will be a centerpiece of a street that will blossom with retail life—as streets worldwide have done after road diets, bike lanes, and better sidewalks slowed down the cut-through traffic and made room for rollers, strollers, and neighborhood shoppers instead. People will no longer be afraid to cross the street for a cup of coffee, a new shirt, or their next bike. Imagine a Figueroa with no more blood in the gutter…. Buy the shop, and you might become not only an entrepreneur but a neighborhood legend, just like Joe! Contact Joe at info@flyingpigeon-la.com. The fifteen grand asking price gets you a much-loved name, a built-up shop with seven months still on the lease, a website, and a bit of inventory. Oh, yeah, and a revitalized city council that will work hard to keep small businesses such as yours thriving in healthy, happy neighborhoods! If you’re not quite ready to become an entrepreneur, you can just donate directly to the campaign through ActBlue. The Joe4cd1 campaign has been pretty happy over getting a mention in the LA Times this week. This plays right into Cedillo’s claim that Joe represents a (mythical) entitled minority who just want to play with their grown-up toys on NELA’s streets. This is simply not true. Although bikeways are definitely a significant plank in Joe’s platform, they are really an enabling technology for neighborhood transformation, along with many other proposals: better sidewalks, rational parking requirements for new construction, encouragement of human-scale developments. These, along with slower, safer streets, nurture the kinds of locally-owned small businesses that cater to neighborhood tastes, rather than try to reshape them to corporate convenience. Businesses that provide more and better-paying retail and service jobs than the retail behemoths typically bring in. Streetscape changes supportive of active travel, transit, and a busy public life on the sidewalks of the Figueroa Corridor mean a physically, socially, and financially healthier neighborhood. Bike lanes have long been shown to be a tool that both slows down deadly traffic and promotes a lively mixing of the public and private realms in our common spaces. Besides letting neighbors get to local stores without being coerced into the material encumbrances of cars. Don’t forget that. Not when you vote, not when you talk with neighbors. Joe’s here for you. I saw something last Sunday in our little neighbor to the west that impressed me mightily…. I was in Santa Monica hunting down a couple of bags of Caffe Luxxe coffee beans as a gift for my wife when I passed by a Breeze bikeshare doc. This is not an uncommon occurrence in SaMo—the docks are everywhere—but what particularly impressed me was that this dock was in the middle of a purely residential area, surrounded by blocks of low-rise apartment buildings. Right at 4th and Washington; that’s it in the photo above. I haven’t yet seen too much of that from Metro Bike Share, the system serving the City of Los Angeles. There is one very large dock in front of the glitzy Promenade Towers complex at 2nd and Figueroa, just outside the famous tunnel, and it seems to be well-used, but it also seems to be an exception. I hope I am wrong, but I haven’t yet seen much attention to purely residential placements of bikeshare racks. SaMo’s homely Breeze dock in front of the sort of places everyday folks can afford is exactly what all bikeshare systems need. SaMo’s are on a street with bike lanes—but that seems to be about half the streets in that city. The Promenade’s dock is also on a street with bikelanes, though if you’re heading west on 2nd they disappear within less than a mile. In the other direction, the tunnel takes you to the busy and very crowded center city, as well as Grand Central Market and loads of other destinations, so what we have here would be a good model for other, high-density but not wealthy parts of LA. I will dare to feel optimistic. Even more so because this morning I saw a Metro Bike Share dock across the street from Evans Adult School—another good placement. At last bikeshare is getting away from the parks-and-offices-only placement paradigm. Who knows? Given a few more progressive City Council members, and LA, the region’s 800-pound gorilla, might be able to lead the change to a cleaner and more equitable future…instead of always playing catch-up.